Bad Boy won Best Technical Clothing Brand nomination! 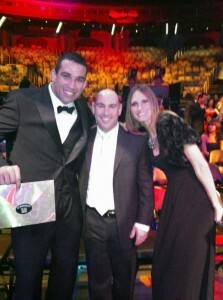 Fabricio Werdum won Submission of the Year (over Fedor Emelianenko). By the way, you can watch the ceremony yourself - Versus is going to broadcast it next Thursday, December 9th. Check versus.com for your local schedule. Picture: Fabrcio Werdum and his wife with Paul Reavlin (middle).